This family home is, gradually, under construction. 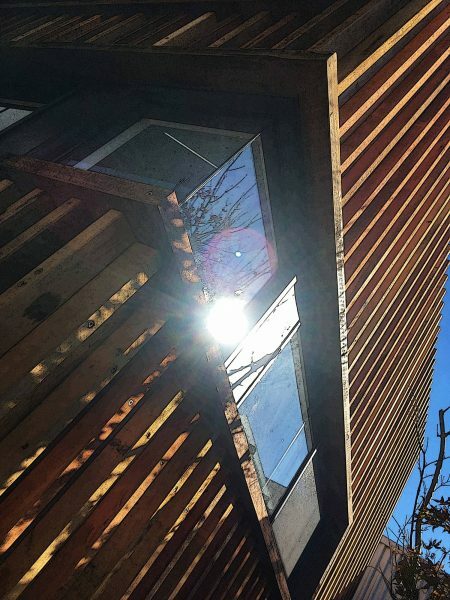 See our ongoing posts of projects during construction on social media at: Facebook, Instagram, or LinkedIn, or a Sanctuary Magazine issue 31 Article here. 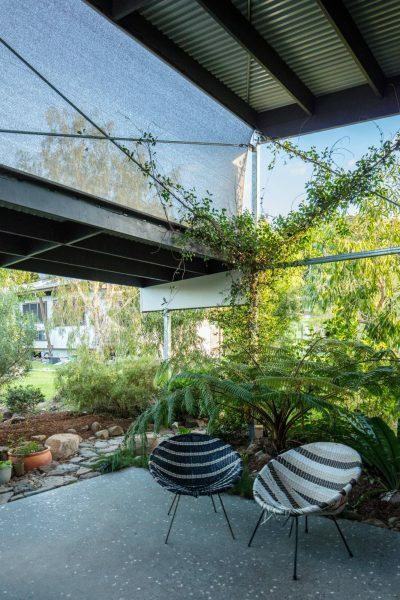 This pavilion home is designed for progressive construction, to an overall master-plan. 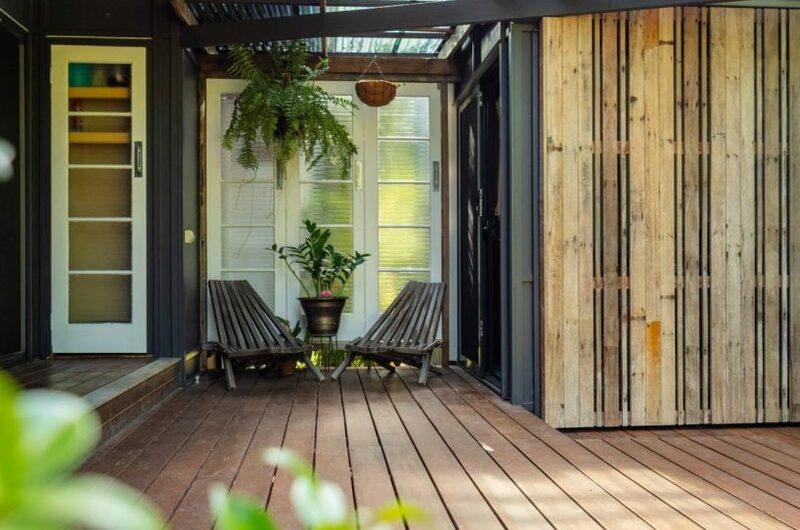 The home is designed to be constructed in stages, to suit budgetary and family requirements. This allows the family to build only the pavilions needed, when they are needed, or when they can be afforded. 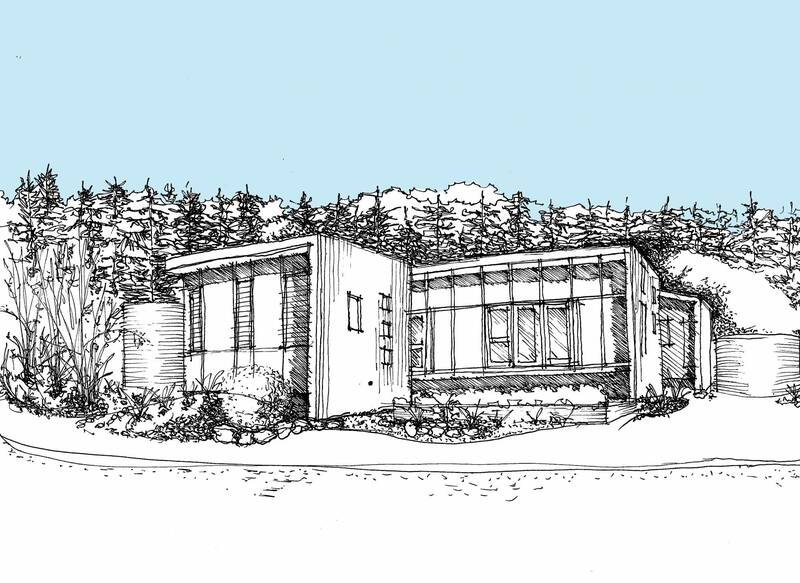 Site Sketch of home illustrating pavilion nature of design, and use of entire site for outdoor rooms and gardens. 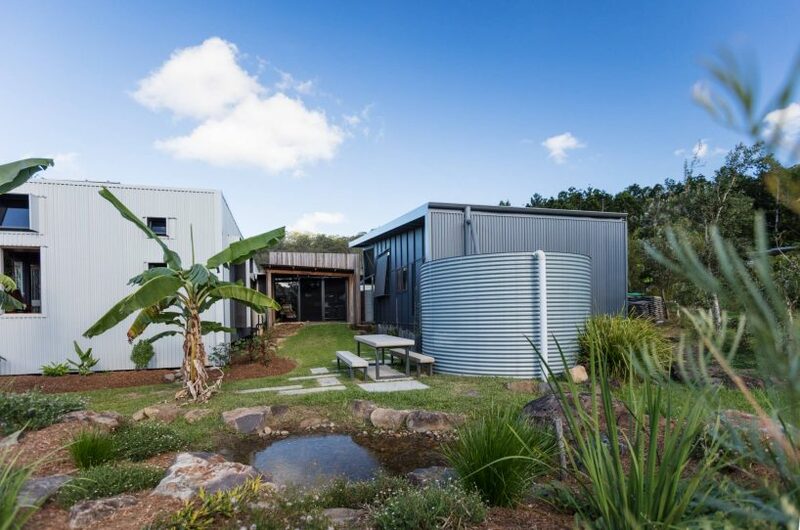 The design turns water flow into a key feature of the home. 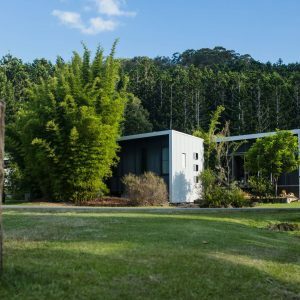 Master planning allows the home and surrounds to continue to evolve, but with an overall intent designed from the outset. The home is designed as a ‘co-house’. 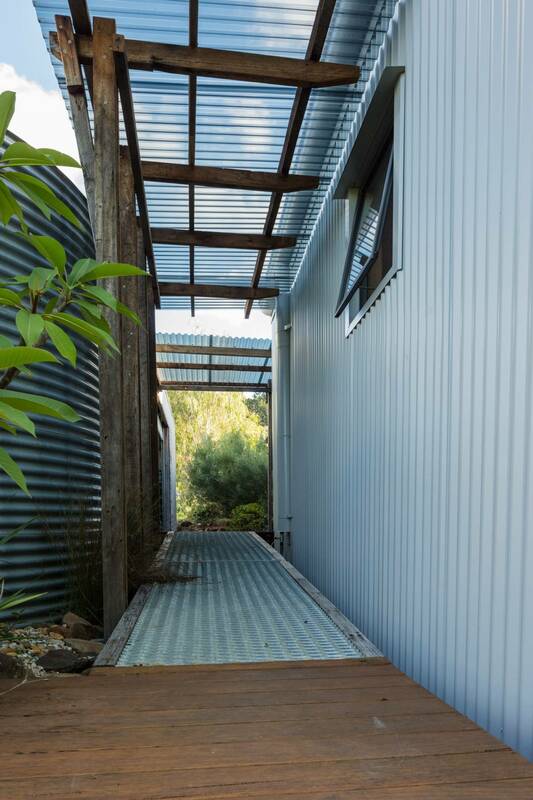 This is a form of shared housing lying somewhere between a granny flat and a duplex but located on one site. 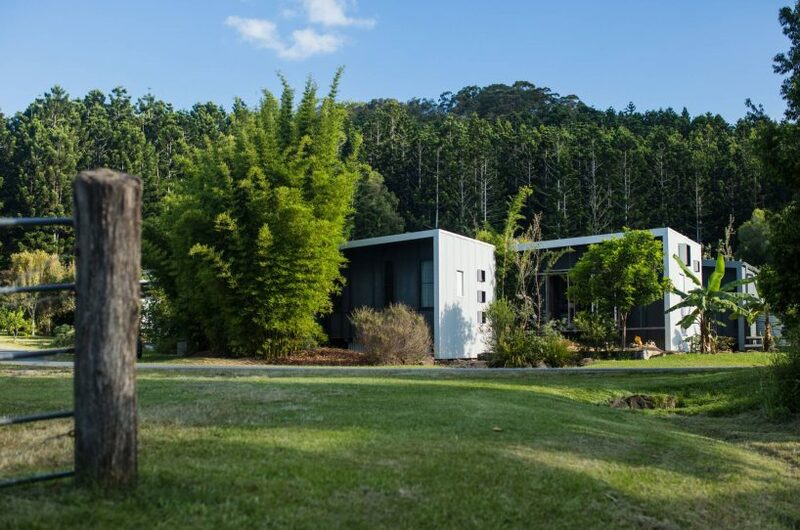 It shares some facilities, and land, to house a group of families or friends where 1 might previously have lived. Rather than being a new idea, it is a rebirth and rethink of the traditional ‘extended family’ lifestyle with all it’s benefits, and complications. 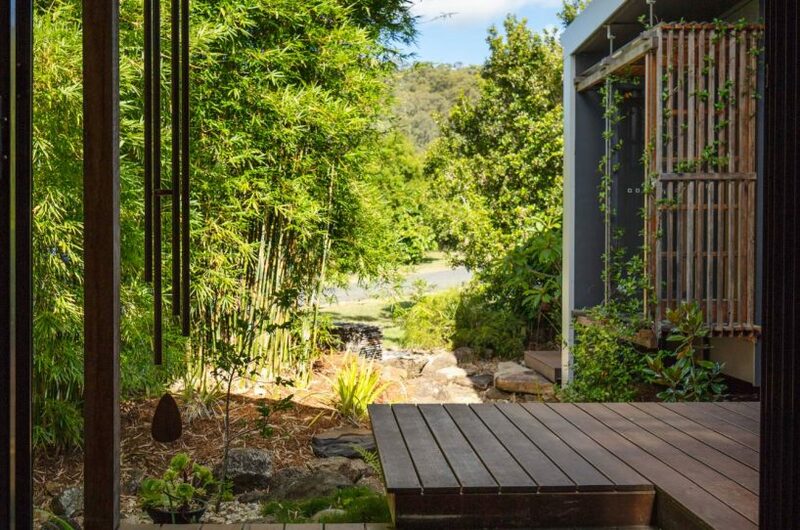 The pavilion design of the home benefits the co-house by creating space and privacy – and also enhances the ability to stage completion of the works. Pavillion nature of the design encourages use of different areas of the site for different purposes. 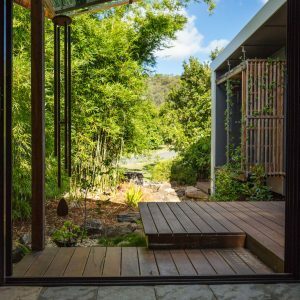 It also creates opportunities in the landscape for private outlook and outdoor rooms – adding to the effective amenity of the home without having to build more building. The Co-House design, and staging of construction, both have the potential for environmental and social benefits. It reduces the dependency on new land to create new homes by increasing density (reducing urban sprawl) while also giving potential for greater social connection in our suburbs. 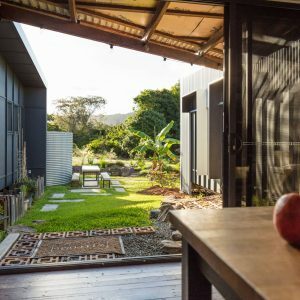 For example it allows for an extended family or friends to live together, but while also maintaining privacy and amenity. 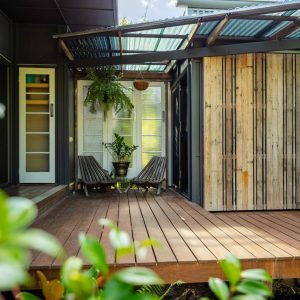 It reduces costs for each party living in the home so that rates, land costs, construction costs, utility costs and the like can all be shared. This design further controls costs by controlling the overall size of the home to maximise the benefits for money spent in the construction. 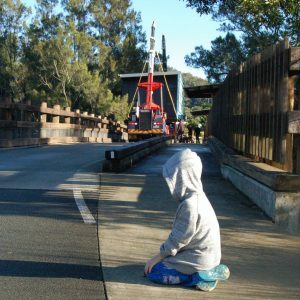 Starting with a very small first stage, the first pavilion of the home was prefabricated, and craned into position on the site. Following stages were constructed on site. Original pavillion (stage 1) was designed to allow transport as a prefabricated pavillion to the site. The pavilions of the home are designed to all face north. They maximise the benefit of warming winter morning sun onto a thermal mass floor (polished concrete.) The design also excludes the summer sun so that the same polished concrete floor stays much cooler in summer. This helps to anchor the house temperature in a more comfortable range, for more of the year. The openings also catch the prevailing cooling breezes in summer, when they are around. 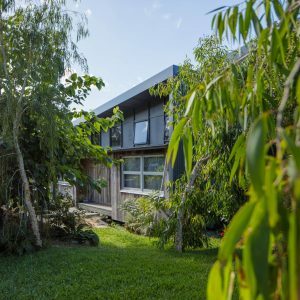 The aim of this passive solar design is to reduce the need to run air conditioning: and when it is running reduce the rate at which it runs. 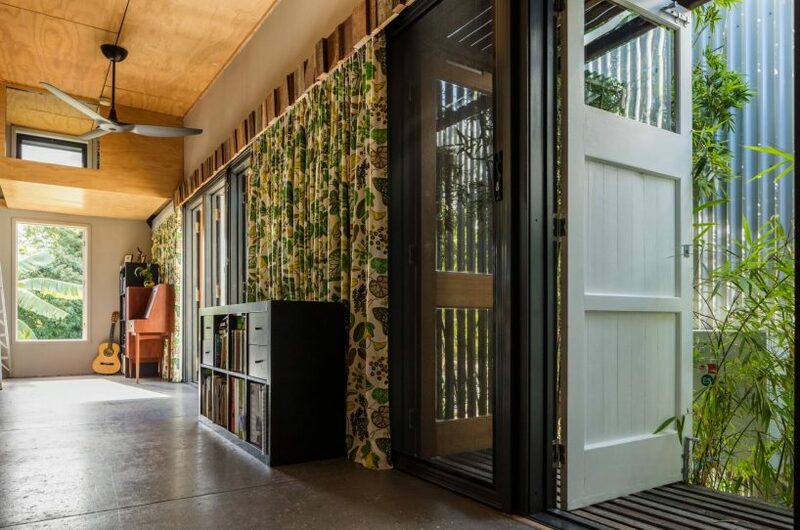 This reduces the cost of air conditioning systems being installed into homes, the cost of running them (energy use) and also improves our lifestyles with more direct connection to the landscape by allowing more comfort with shaded open windows and doors. This modern home design follows a strict palette of materials, colours, and set-out. 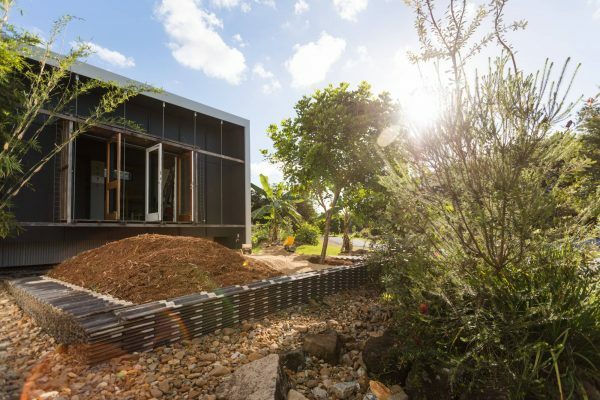 It features recycled elements including doors, windows, kitchen, feature timber, and the like. 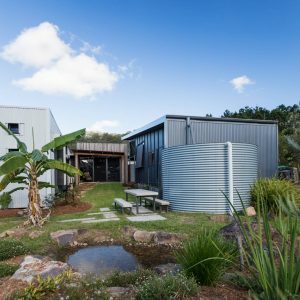 This home incorporates solar pv panels with a home battery added in 2016. You can read more about the battery performance on our blog here. 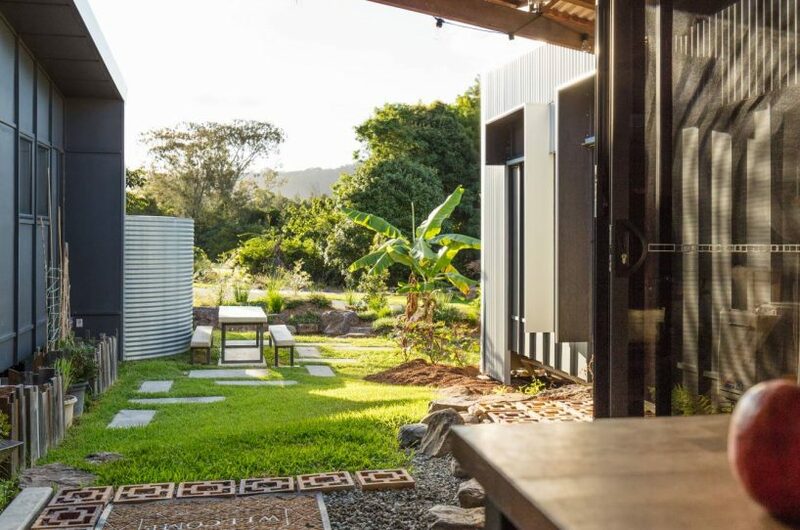 It also includes solar hot water, significant rainwater storage, and a hydronic floor heating system for future connection should it be required. 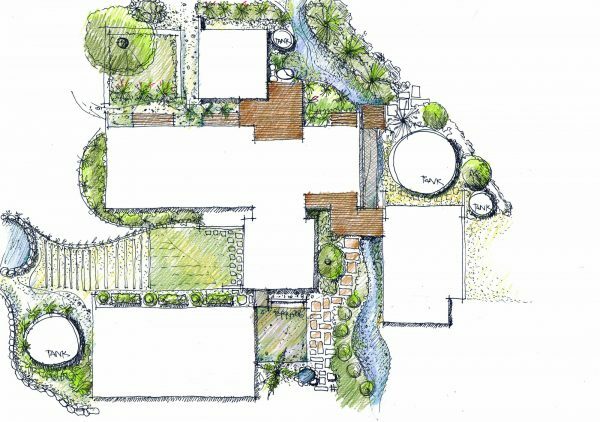 We are developing the garden design in association with a landscape architect to manage the significant stormwater surges across the property, provide privacy, and highlight the passage of seasons with a mix of edible and deciduous plantings. Evolving landscape: The dry creek bed (in foreground) absorbs significant stormwater and holds it on site. 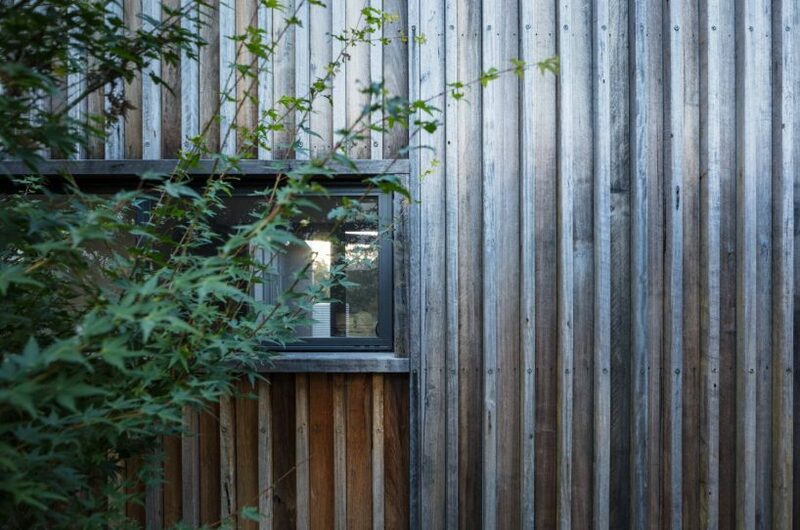 The landscape walls are recycled roof tiles, incorporates to allow flexible re-working of landscape on site over time with minimal waste or impact. The garden bed in front of the house, will form a landscaped terrace to play in, stepping out from the house. The pavilion design of the home is all on one level. 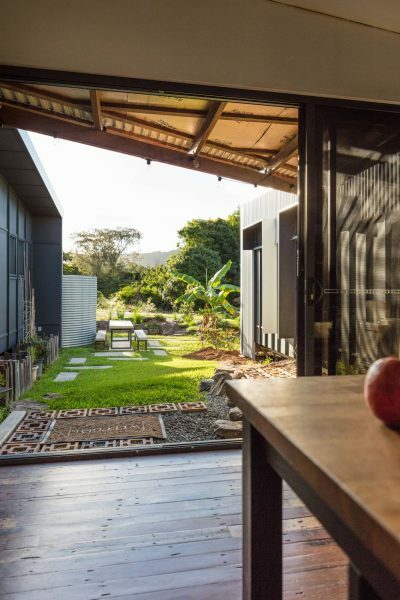 However, the pavilions allow courtyards and landscape spaces to wrap through the home and connect the occupants more intimately to their site. Evolving Landscape: The landscape wraps around and through the home, and is slowly growing over it. The shaded court provides a suitable environment for the native tree fern as well as flowering / scented plants. These in turn shade the internal spaces beyond. They provide for informal gathering areas around the house, which suit different times of day and different times of year. Engaging in a slower process, and encouraging the evolution of design and construction: allows us to enjoy changes as they happen. For the occupants to better understand themselves and their house. And, to appreciate the difference which the changes make to life in the home. Like tasting the ingredients of a meal as they are slowly prepared and cooked. And to gradually evolve the design in response to that experience. 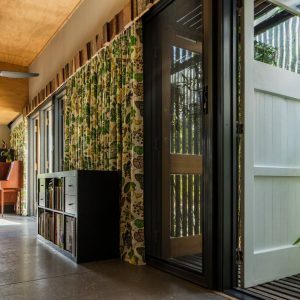 It has enabled us to source various recycled elements and incorporate their reuse into the home – where a modern start to finish construction would make such flexibility and evolution difficult. Design details are being progressively layered to the home, to improve the function of the home, it’s beauty, and our enjoyment of it. Detail Elements: Details are being added to the home, as the landscape evolves around it. 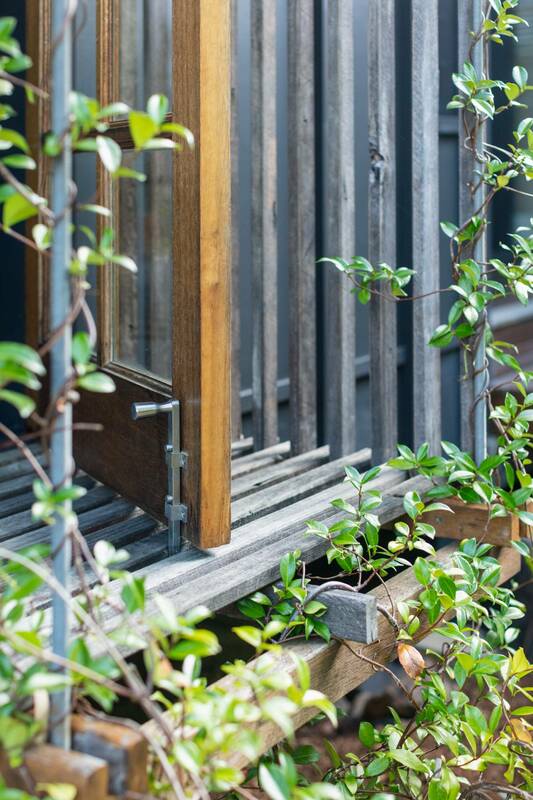 The lock to the door drops between decking boards, to allow the door to be held open in any position to balance sun and shade, and breezes. Detail Elements: The entry ramp to the home is a pressed metal sheet, which can be lifted from it’s hardwood frame to allow cleaning below. 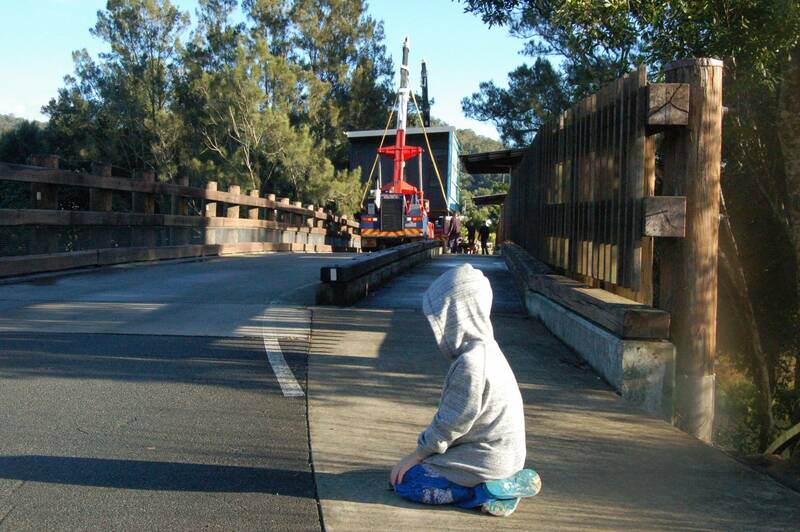 A dry creek bed runs below the ramp, allowing passage of stormwater. The tank overflows feed to this dry creek bed, helping to water gardens and raise the water table on the site. The polycarbonate pergola over is set-out to allow entry of winter morning sun, but combines with the tank to exclude summer morning sun. The kitchen pavilion was the last constructed stage of the home. This provides a central connection and meeting place between the pavilions. It is a visual focus from all sides of the home. 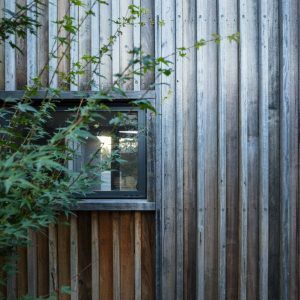 It has been finished to a higher standard so that the warmth of the timber cladding can be enjoyed from different aspects both around and within the home. 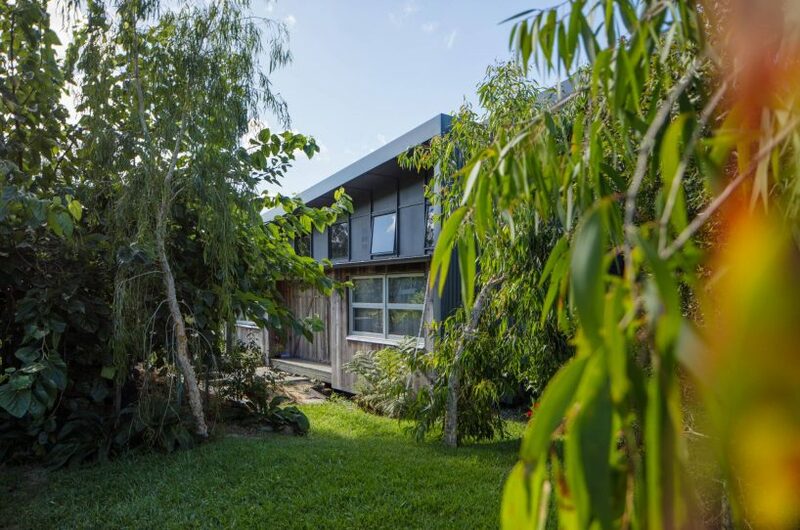 The last stage of the home constructed was the kitchen, clad externally with Australian Hardwoods. Further stages to follow, updated here over time.